Place the cueball on the footspot, and freeze the 8-ball behind it, in line with the corner pocket. Freeze the 2-ball to the 8, pointed straight up the table. 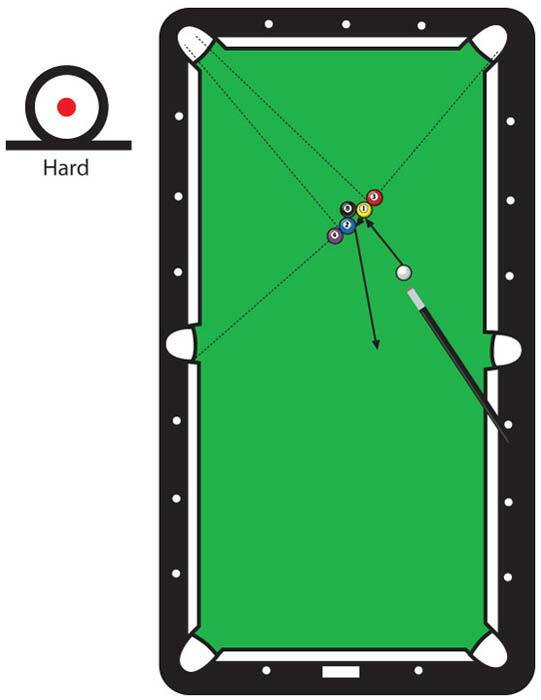 Freeze the 1-ball to the 8, pointed straight at the side rail. There should be 1" to 1 1/2" of space between the 1 & 2. Then freeze the 3-ball and 4-ball, respectively, to the 1 and 2, so that the frozen pairs are lined up at the outside edges of the side and corner pockets. Remove the 8, and place the cueball in front of the shot. Stroke very firm centerball, cutting the 1-ball slightly backwards, while caroming into the 2-ball. All four balls should go in with one stroke of the cue.